Please accept my gift to the Alpha Delta Pi Foundation to help the Foundation do even more for Alpha Delta Pi sisters everywhere! Please visit our Recurring Gifts Page if you are interested in making your monthly, quarterly, or multi-year pledge online. If you are an undergraduate member seeking to make a gift to join the 1851 Violet Circle, please visit www.violetcircle.org. I would like information about planned giving and the Summit Society. I have included the Alpha Delta Pi Foundation in my estate plans. I would like information about making a gift of stock. Please verify that all items above are correct, and then click the “Submit” button. Clicking the “Submit” button will process your donation and result in a charge to your credit/debit card. Please click the “Submit” button only once, as clicking it multiple times may result in multiple charges to your card. Thank you for your gift to the Alpha Delta Pi Foundation! 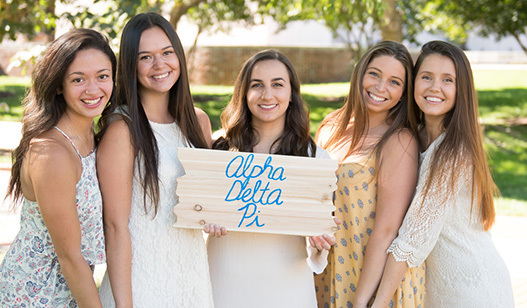 Gifts to the Alpha Delta Pi Foundation are tax deductible as allowed by law.